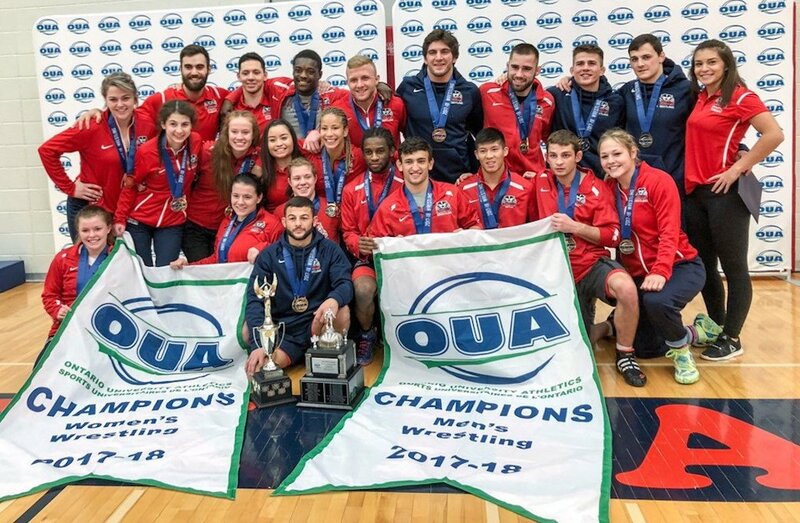 In a lineup of seven Ontario University Athletics (OUA) athletes, Kayden Johnson stands out from the ranks at the University of Windsor’s Can Am Meet. Standing at 6-foot-3, his presence is felt at the sprinting blocks. The athletes take their marks, and with the start gun, Johnson bursts out ahead of the other runners, his long hair flying behind him as he breezes the 60 metres to the finish line. With a final time of 8.21 seconds, Johnson takes home gold in the 60 metre hurdles event — and that’s not even his best time this season. The York Lion is currently ranked first in U SPORTS for the event, with a time of 8.14 seconds, 0.6 seconds ahead of his closest opponent. 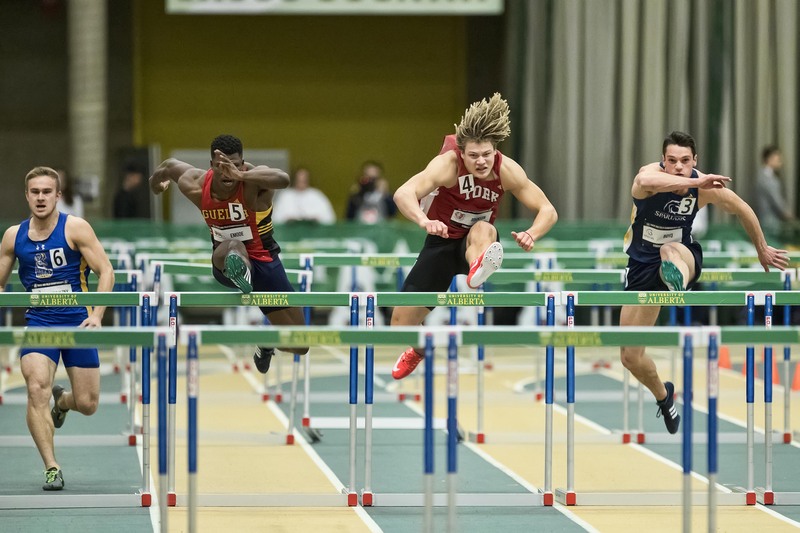 He has automatically qualified for the U SPORTS championship to be hosted by the Windsor Lancers Mar.7-9 and it’s only his first year focusing on short sprints. He is no stranger to track though, having been a heptathlon and decathlon athlete since high school. Both events include a hurdle event, alongside things like pole vault, shot put and a longer distance run. But, with the return to the 2018 season, Johnson made the decision to narrow his focus to short sprints alone — they were his favourite events from those multi-discipline track competitions – and it was a no brainer. The switch over to short sprints also has a unique advantage for the York Lion: a better transition between his fall sport, football, and his spring track season. “I don’t have to drop as much weight after football season as I do to be a decathlete,” says Johnson, a native of Kerrobert, Sask., about two hours west of Saskatoon. It’s no insignificant number in any case, as he is listed as weighing in at 220 pounds during the 2017 football season, and has dropped to 195 pounds for the current track and field season. Even before his university career began, Johnson has balanced both football and track at an elite level — even throwing basketball into the mix before narrowing his focus in high school. On the football side, he represented Canada in back-to-back U19 International Bowls and represented his home province Saskatchewan in the Football Canada Cup. In track, he placed fifth in the decathlon at the Pan American junior championships wearing the Canadian uniform. So, naturally, when university came calling — initially with the Saskatchewan Huskies — Johnson committed to both varsity programs. In 2015, he made the move to his current home at York University, joining both the track and field and football team at the Toronto campus. Since then, he has been a staple on both teams. As a York track athlete, he has won the OUA silver medal in heptathlon and finished fifth at the U SPORTS Championships for the same event, earning him an OUA second-team all-star honour. This past football season, he had 56 rushes for 270 yards, and five catches for 66 yards as a Lion. How does he make two varsity sports work? For some, two programs may seem like a hard balance. But for Johnson, it’s all he’s ever known. I’ve never done just one sport, so doing multiple sports is all I know and I love it and I have big dreams in both sports — I’d like to go as far as I can in both. The sports even benefit one another. As Johnson explains, the power, strength and speed from football benefit his hurdling. On the other hand, the speed he gains in track benefits his position as a running back on the football team. But, being a dual-sport athlete also comes with some challenges, which Johnson admits. The social aspect of competing in two seasons can be tough, he says, especially when considering his teammates on the gridiron. As if that wasn’t enough, the hurdler is also the only Lions varsity athlete who is majoring in theatre — a program that comes with the added workload of performances and rehearsals. To date, he has been in several plays on campus including Moss Park and Angels in America. Johnson does benefit from the flexibility of the theatre program though, as he is able to switch around his rehearsals when he is competing or training. That said, the Lion isn’t fazed by his to-do list; in fact, all three passions still feature in his career goals going forward. “I’d definitely like to play professional football — CFL or NFL — and then I’d like to be an Olympic hurdler as well,” Johnson says, adding he also wants to pursue an acting career in film or television. Big dreams, and all still a possibility. The 2019 CFL draft may be his first opportunity to knock one of them off the list too.